Echo always knew the ocean was in her blood. It isn’t until the day tragedy struck, though, that her ordinary life in a New England seaside town is torn apart and she finds out just how much her fate is tied to the sea. Monsters, real monsters, crawl out of the ocean looking for her, and suddenly she’s swept up in a swashbuckling tale of magic, myth, war, and fear. Joined by her best friend Yuri, the smuggler and magician Barnabas Coy, and Artem, the last son of the Amazons and greatest swordsman on the Seven Seas, Echo will face were-sharks and leviathans, assassins and mermaids, and find out that her ultimate destiny lies at the bottom of the ocean, with the lost city of Atlantis, and the war that city is planning to start with the surface world. Which side will she choose? What does Atlantis mean to Echo’s past, and for her future? Will she take her place among the other myths and legends of the sea and become the hero she’s meant to be? Alongside the smuggler and sea-mage Barnabas Coy, her best friend Yuri, and the warrior Artem – the only living son of the Amazons – she’ll find a wonder and horror, face tragedy and transformation, and become something she never imagined in her old life: a hero. 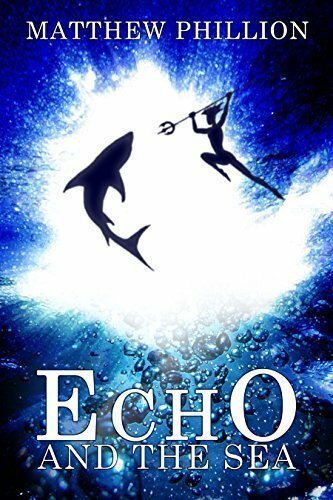 Set in the same universe as the Indestructibles series, Echo and the Sea introduces another side to that world, one where magic and myth meets swashbuckling adventure. Journey to Atlantis with Echo and her crew and find out what wonders lies just beyond the horizon, and what nightmares lurk just below the sea’s surface.